Many brides hide their "something blue" in their garter, but wedding flowers that are blue can be a bold and elegant way to indulge in this wedding tradition with style and flair. Blue accents can match the bridal party dresses. Choosing wedding flowers in a similar blue hue is a great way to contrast or highlight the bridal party color scheme. From pale sky blue to rich navy and midnight hues, there are many shades of blue to choose from. Blue can be a primary color for the bridal party dresses or it may be a more subtle accent used as filler in bouquets or floral centerpieces. Centerpieces can use blue flowers. However it is used, blue is a beautiful color to choose for your wedding. Bright blue is best for summer wedding flowers. There are many wedding flowers that can be found in different shades of blue, including hyacinths, hydrangea, delphiniums, sweet pea, lilies, veronica, lupine, phlox, tulips, roses, bayberry, and columbine. If your preferred blooms are not usually available in blue hues, many wedding florists can dye or tint different flowers into the proper shades of blue. Another option is to choose silk wedding flowers in the perfect shade of blue. Add blue lilies to your wedding cake. Hydrangea is simple and lovely. Blue is perfect for a spring bridal bouquet. Blue shades also pair well with other popular wedding colors, such as silver, white, yellow, green, pink, and purple. Blue roses are romantic and luxurious. Line the aisle with simple blue wedding flowers. Blue gerber daisies work well with rustic peonies. Wrap stems in blue satin for extra elegance. A small all-blue bouquet is stylish. Be perfectly patriotic for a military wedding. Delphinium is a popular wedding flower. Add blue silk roses to your wedding dress. Blue and yellow is a popular color combination. Wherever blue is used, it is sure to make a colorful and stylish statement. Interested in more wedding flower ideas? 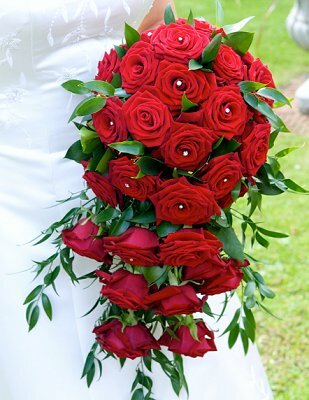 Check out Calla Lily Bridal Bouquet Pictures and Rose Bridal Bouquets for wonderful ideas.